The powerful benefits of low-NOx burners & boilers, and why you should make the switch. The 3-stage process of low-NOx combustion, which is key to understanding how the technology works. The top low-NOx burners & boilers for different applications. Your potential emissions savings from upgrading your equipment by using our low-NOx calculator. 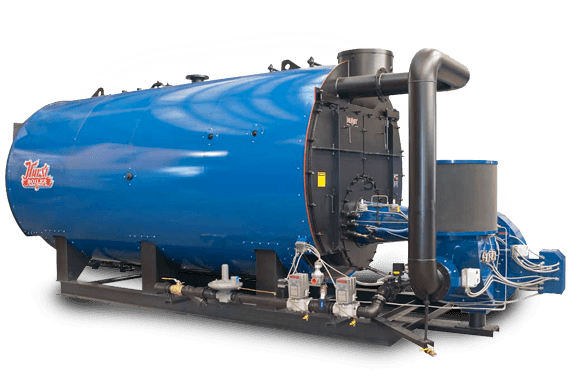 How Do Low NOx Burners & Boilers Work? Today's ultra low NOx boilers use advanced technology and methods to reduce NOx emissions. Low NOx burners are designed to control air and fuel mixing at each burner, which creates more branched and larger flames. By reducing the peak flame temperature, significantly less NOx is formed in the process. The improved flame structure simultaneously reduces the amount of available oxygen in the hottest part of the flame, which improves the efficiency of the burner. In conventional low NOx burners, combustion, reduction, and burnout are achieved in three different stages. STAGE 1: Combustion occurs in an oxygen deficient, fuel rich environment. This is typically where the NOx is formed. STAGE 2: A reducing atmosphere follows where the hydrocarbons are created. These hydrocarbons interact with the already formed NOx. STAGE 3: In the final stage, additional NOx may be formed from the completion of the internal air staging. However, this additional NOx can be further minimized by conducting the combustion in a lean air environment. At Applied Technologies of New York, we pride ourselves in partnering with the leading low NOx boiler manufacturers in the world. Our manufacturers utilize state-of-the-art technology to reduce the production of NOx through reburning, overfire air, flue gas recirculation, and various other cutting-edge methodologies. By combining Low NOx burner technology with other primary measures, our equipment effectively achieves up to 74% NOx removal efficiency. Fulton's low NOx combustion technology features high-precision servo motor control and outperforms other conventional platforms with up to 15:1 turndown ratio. O2 compensation effectively fine tunes the fuel/air ratio in real time, which bolsters efficiency across all modulation rates and automatically adjusts for seasonality. Most importantly, certain boilers in the Fulton lineup are configurable to achieve NOx emissions less than 9 PPM. Power Flame has a strong belief in providing flexibility of choice in NOx reduction techniques. The sales engineers and factory-trained technicians at ATI of New York will bridge the gap between Power Flame and your low NOx emissions needs. Power Flame products have produced NOx reductions over 40% on oil and 60% on gas. With Power Flame NOVA concept, you gain the power of choice. Power Flame burners can even be field retrofitted by implementing the appropriate retrofitted low NOx module kit to the current system. Browse all Power Flame Nova low NOx burners. Browse all Weil-McLain low NOx boilers. Why Go to Applied Technologies of NY for Your Low NOx Solutions? At Applied Technologies of New York, we take a special interest in helping businesses realize the extraordinary benefits of low NOx technology. In addition to reducing the carbon footprint of your business, our Low NOx equipment will increase the return on investment by extraordinary measures, which explains the experience of Climate Change & Environmental Services (CCES) & East River Housing (ERH). After a single year of the installations, CCES has already began to see the amazing cost savings and outstanding environmental benefits. ​If you're ready to reduce your carbon footprint, improve efficiency, and bolster the bottom line, contact Applied Technologies of New York for a free consultation. Find out which low-NOx solution is best for you by speaking to an expert!